ysabetwordsmith | Poem: "Borrowed Thyme"
This poem came out of the April 7, 2015 Poetry Fishbowl. It was inspired by prompts from moongoddessgirl, lynnoconnacht, kelkyag, and alexseanchai. It also fills the "mothers and fathers" square in my 3-16-15 card for the genprompt_bingo fest. This poem has been sponsored by Anthony & Shirley Barrette. It belongs to the series Frankenstein's Family. to go through the kitchen with her. and she wasn't all that good at reading. of tiny curled grey-green leaves. "Mizila," she said at once. That wasn't a name familiar to Igor. letting her taste the purple cordial. just wasn't Fridrik's strong suit. but definitely not fine for the poisons. the characteristics and effects," Igor coaxed. because the treatments are different." pushing it away as far as he could. Fridrik kept his face turned away. one poisonous plant at a time would do. discuss plans for later use. most of the other equipment. had been gnawed by vermin. "New shelves would be nice?" "We might salvage some of this,"
shelves the rats have been all over,"
Igor said firmly as he pulled the board away. for Lóránt to make new shelves." upstairs was in perfect working order. cleaning out the place, at least," said Béla. then each of them carried an armload upstairs. The children were not in the drawing room. as he stacked his load by the fireplace. Adam snuggled into Victor's lap. and looked at them. "How fares our cheese room?" but the room itself seems fine." "Circus comes from Latin and it means circle,"
Crina piped in a jumble of languages. "That's where we get circular too." "That's nice, dear," said Évike. "And phenomenon comes from Greek,"
instead of phenomenas for more than one. It means a thing that happens." can't be good for you," Évike said. "It will make your memory go soft." and he was heartily sick of it. "Is that what you think of me and Igor?" I never meant to imply that you -- that he --"
is how we know to solve so many problems,"
what we discussed about cheese." "Yes, mazil," said Évike. She looked at Crina. "I hope you found something interesting in here." instead of bouncing with the joy of discovery. before it was time to head home. a quiet supper with the werewolves. and growled at the boy. off his chair and rolled him onto his back. "He plays with our cubs. He hears our words,"
she said. "Do not challenge me on this." and showed her his throat. of some kind?" Victor asked. children, they grab words like candy." that we cling to what little we have left." and we could choke the life out of it." in Dacian and Romanian, a word for cheese." reached for the pale wheel on the table. cheese spread with herbs," he said. from Egyed to make it." as she devoured the cheese. and dill -- the leaves, not the seeds." not quite hidden in high grass. Romania's checkered past has left it with many languages. In this village, most people speak Romanian. Some families speak Hungarian or some other language. The people who live in the village proper are most likely to speak several languages, at least enough to conduct basic business, because they deal the most with merchants and other travelers. Codeswitching entails changing between registers within a single language or across different languages, within the context of the same conversation. There are many reasons why people do this, and one that's not often mentioned is what happens in this poem: people using bits of non-native language to cobble together effective communication when they don't share a mother tongue but do share one or more others of varying fluency. This is typical of conversation in Europe and other multilingual environments: if you get stuck in one language, try all the others you know. The Dacian language, here used by the werewolves, has been partially reconstructed. Mizila is the Dacian word for thyme. In Romanian it is cimbru. Seba is the Dacian word for elderberry. Zena is the Dacian word for poison hemlock. Know about hemlock poisoning. Poison is a historic method of killing wolves, and in this context, also werewolves. A creamery is a place for processing cream and other dairy products. The castle creamery is near the kitchen as part of the food handling complex on the left side of the great hall. A cheese cave is for storing cheese while it ages. The key to producing well-aged cheese in any quantity is that you need a secure place to store it for a long time. A cheese room can be a place for making and/or storing cheese. Here folks are using creamery for the upper space and cheese room for the lower space. 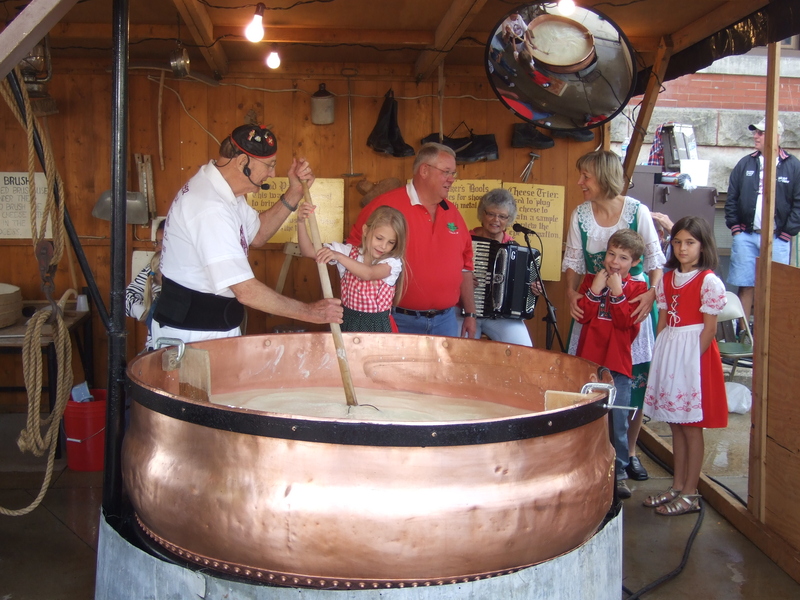 The big copper cauldron for making cheese is in the upper room, because the lower room on the basement level lacks a fireplace for heating the milk to separate curds from whey. 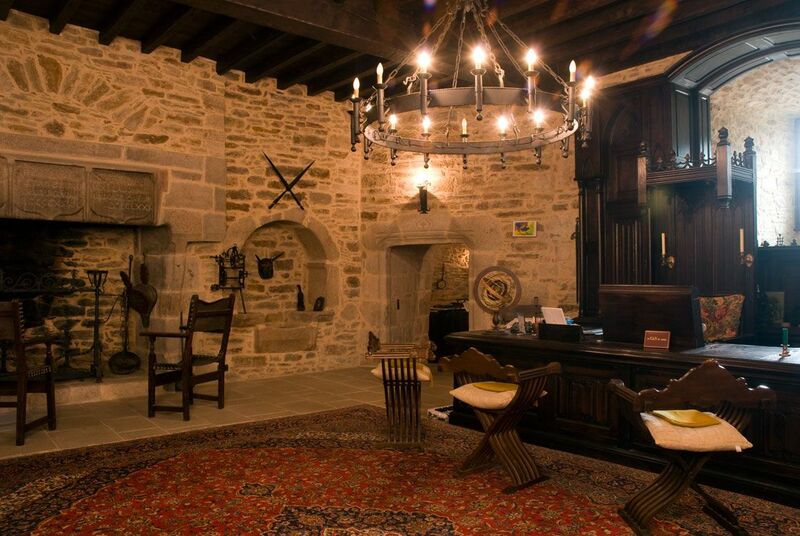 Once properly restored and stocked, the castle cheese room will look something like this. The pressing table and cheese presses are down here too. The drawing room is a large comfortable room off the right side of the great hall. They use it similar to a modern living room, because the great hall is just too ridiculously big for family activities. Loanwords come from another language. Here are some that English received from Latin and Greek. Ara is the Dacian word for river. In Romanian it is fluviu. One word for cheese, brânză, is the same in Romanian and Dacian, thus probably a Dacian loanword. Raising multilingual children has its pros and cons. Among the challenges are that sometimes parents refuse to pass on a heritage language, and other times native speakers resent outsiders trying to learn it. The conflict between Shandor and Mircea is one example typical of families who speak a different language than the local vernacular. Shandor's response shows that he's still reticent about dealing with humans and not keen on sharing his culture. Mircea's response shows that she already considers Adam part of their pack, and would rather share their culture than risk it dying out. That she wins is a sign of how werewolves tend to manage rank and leadership: the males make a lot of day-to-day decisions, but the females have final say on matters of family and culture. Enjoy a recipe for Romanian Herbed Cheese Spread. It's often made from the softer goat or sheep cheeses. Egyed raises goats and sheep for milk, meat, and wool. Béla keeps a big herd of cows, primarily for milk. People who can't keep their own dairy animals, or don't have enough for things like cheese, may turn to them to make up the difference. Évike is the best cheesemaker, so in addition to making cow-milk cheeses from their own herd, she also gets goat and sheep milk from Béla. I love language and cheese. So, good poem. Herbed goat cheese is delicious. Chocolate goat cheese is good, too. I'm happy to hear that. If you want to keep following the cheese thread, by all means prompt for it. They'll need a month or so to get the equipment replaced, and by then the sheep and goats should be freshened up again. Lambing/kidding season tends to start around the beginning of February. Calves tend to come a little later. By the time they get they equipment, there will be milk for making at least some cheese. Agreed. I like many types of goat cheese and herbed cheese. Imagine the fun they could have with Evike's cheesemaking experience, Igor's considerable knowledge of herbs, and two industrial-size rooms to play in. Possibly with the addition of Denes, who is not a cheesemaker but is fascinated with live cultures and also adept with herbs. Lemon goat cheese is possibly the best food I've ever eaten, and I have sensory processing disorder so that's saying something (when something's good, it's AMAZING). :p I hope they get some! Some of them already do. The goal is to get more of them to do that. Previously they didn't have much opportunity or use for it. That's changing. I only caught the pun at the end, when it becomes obvious it's a loanword. Hee. I love this sort of wordplay. <3 And cheese! I'm glad you enjoyed the wordplay here. Languages are fun! I'm glad Adam is likely to grow up at least somewhat multilingual; it seems to me that makes other things, not just languages, easier to learn. It does for many people. It's a good poem. I'm enjoying reading this series. I wanted to keep goats when I was a kid. These days I prefer herding books and flowering plants to animals. I'm glad you're enjoying this. Goats can be fun, or trouble, or more often both.